If you or your loved one has aphasia, you know how challenging it can be to communicate with others. It's sometimes hard to get the message out, and perhaps even harder to be understood. That's where aphasia support groups can provide something most of us long for: connection with others who understand what life is like with aphasia. That's why Lingraphica created a support group initiative we affectionately call "31 Flavors." We know that every support group is different—some are run by speech professionals; some are run by people with aphasia. Some are structured; others are not. Some are technology-based; some are focused on practicing speech. Whatever your support group looks like, Lingraphica wants to connect your group with others. 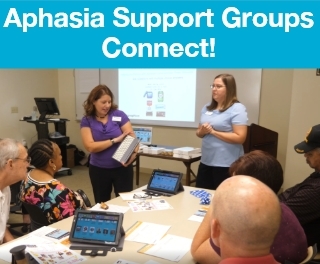 Click below to watch a video we created to show how we can possibly work together to create even more aphasia connections. If you'd like to connect your group with others, we encourage you to share this blog post with your group leader. Click below to see how we can work together, or call us at 866-812-3859!